The rotator cuff is a group of tendons in the shoulder that provide support and enable a wide range of motion of the shoulder joint. Major injuries can cause rotator cuff tears. A rotator cuff tear is one of the most common causes of shoulder pain in middle-aged adults and older individuals. A rotator cuff tear may occur with repeated use of the arm for overhead activities, while playing sports or during motor accidents. A rotator cuff tear causes severe pain, weakness of the arm, and crackling sensation on moving the shoulder in certain positions. There may be stiffness, swelling, loss of movement, and tenderness in the front of the shoulder. A rotator cuff tear is best viewed on magnetic resonance imaging. Symptomatic relief may be obtained with conservative treatments – rest, shoulder sling, pain medications, steroidal injections and certain exercises. 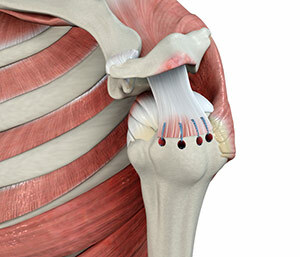 However, surgery is required to fix the tendon back to the shoulder bone. Surgery to repair the rotator cuff has traditionally been done through a large shoulder incision, about 6-10cm long, and the muscle over the rotator cuff was separated. Newer, advanced surgical techniques have been developed to minimize pain and recovery time. Arthroscopic rotator cuff repair is a minimally invasive surgery performed through tiny incisions, about 1 cm each, with an arthroscope.